MyMemories Blog: Documenting Your Life Blog Series with ADB Designs! Documenting Your Life Blog Series with ADB Designs! More of the angst of the teen years…. Describe the hair and clothing styles that were popular when you were a teen. What did you like best and least about your appearance as a teenager? When I was a teen "straight" long hair was the rage ... my friends had to iron their hair ... not me, I had (and still do) have completely straight hair. When my daughter was a teen (in the 80-90s) it was BIG BIG hair and since her hair is naturally curly (very very curly) all she had to do was "fluff" it and voila, she had big hair! This week I would like to introduce you to my new collection LALANI OF HAWAII. Lalani is my latest collection in the Dolls of the World Series. I love the colors and the selection of beachy themed elements, it is perfect for your vacation photos. 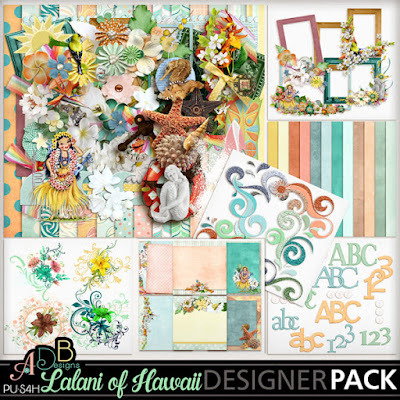 Lalani is on sale for 30-62% through Sept. 11.